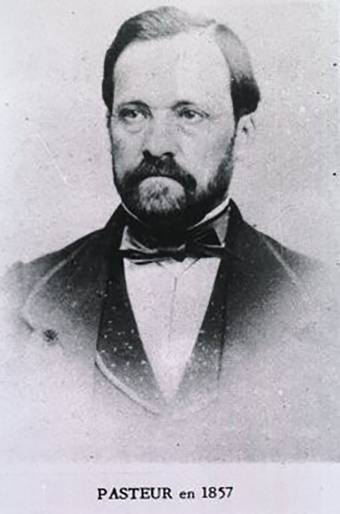 Louis Pasteur was born in Dole, France in 1822, and by the age of 25, he had earned bachelor of arts and science degrees, as well as a doctorate in science from Paris’ École Normale. Within a year, he joined the faculty at the University of Strasbourg as a chemistry professor. In 1854, he joined the University of Lille as professor and dean of the science faculty. It was here that Pasteur first took up the problem of alcoholic drinks turning sour. In 1856, after being commissioned by the father of one of his students, M. Bigot, to discover what was ruining a certain beet root alcohol, Pasteur examined samples under the microscope and discovered not only spherical yeasts, but also a rod-shaped microorganism, Acetobacter aceti, which it turns out converts alcohol to acetic acid. Methodically and systematically experimenting with both lactic and alcoholic fermentation, Pasteur concluded that fermentation was not the result of a spontaneous generation of chemical reactions by enzymes (the then-majority view), but rather the work of these microorganisms. In 1857, Pasteur returned to the École Normale as director of scientific studies and continued his research on the problem. Notably, on April 20, 1862, he completed his first test of boiling and then cooling wine to kill the souring bacteria, a method of wine preservation (heating) that the Chinese first discovered as far back as 1117, though of course this was likely unknown to Pasteur. Continuing his research into heating the liquid, Pasteur, who patented his heating and cooling process in 1865, discovered that the wine could be saved from souring and the original flavor preserved by heating it to a mere 50-60 degrees Celsius or 122-140 degrees Fahrenheit. Quickly adopted by the wine industry, the general pasteurization process was not widely applied to milk for several years afterward, to the doom of many thousands, as raw milk at the time was particularly a common carrier of tuberculosis. Not content to rest on his laurels, and still fascinated by microbes, Pasteur went on to help save the diseased silk industry in France as well. Viewing the dead and dying silkworms under a microscope, Pasteur discovered two microorganisms that appeared to be the culprit for the problem plaguing the industry at the time. He then helped develop a process to eliminate the offending microbes from future generations of silk worms. This proved (at least to him) his theory that microorganisms caused disease (called germ theory), and after the fall of Napoleon III, Pasteur negotiated a deal with the new government that garnered him a new lab, a nice pension and the freedom to study how microorganisms cause disease full time, instead of doing it in his time outside of his teaching responsibilities. In short order, Pasteur discovered a vaccine for fowl cholera, albeit a bit serendipitously. He left a tray of it standing idle while he went on vacation, and as a result the struggling microorganisms had lost much of their potency by the time he got back. One of his assistants, Charles Chamberland, was supposed to have maintained the dish by continually inoculating chickens, thereby keeping his stock of the culture vibrant, but he failed to do so. After Pasteur used the weakened culture on his test chickens and they survived, he discovered the chickens in question were also now immune to the disease. He then began further experimentation with weakened strains in 1879 and soon realized he had developed a vaccination for the disease. They soon discovered that the rabies virus could be weakened (attenuated) by injecting it into other species, which Pasteur and his little credited colleague, Pierre Roux, did with monkeys and rabbits. By 1885, they had already had success with a rabies vaccine for dogs, including one that worked on animals that were already infected. It was then that Pasteur very reluctantly agreed to try it on a human, nine-year-old Joseph Meister who had been mauled by an infected dog and was thus likely doomed to a terrible death absent intervention. In testing the vaccine on Joseph, Pasteur was opening himself up to a bit of legal trouble as he was not a licensed physician, but he went ahead with it anyway. The vaccine on little Joseph was completely successful, and not only did he not face any legal ramifications, it further bolstered Pasteur’s reputation as a world renowned scientist. The sale of vaccines also helped fund the Institut Pasteur, which continues today to be one of the world’s premier biomedical research institutions. can you turn off your caps lock buddy?? ?